Update 2: No Gaddfi speech appears forthcoming, as his regime is in tatters. However, the LIbyan leader did appear on TV with an umbrella to say that he’s in Tripoli, not Venezuela. Update: According to Al-Arabiya, Gaddafi may soon deliver a televised speech. Original post: All hell appears to be breaking loose in Libya. According to Al Jazeera, military jets have bombed protesters in Tripoli. 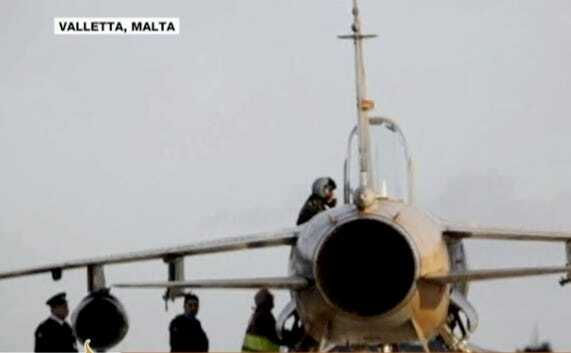 Other military jets have reportedly refused orders to bomb protesters and have instead flown to Malta. The pilots of these planes, “senior colonels” in the Libyan military, have reportedly defected to Malta. The US and Europe have warned Gaddafi that the violence must stop. Gaddafi is said to be using “mercenaries” to attack protesters. Italy vehemently denies rumours that its fighter jets are being used in such attacks. Brent Crude (oil) has soared above $105 a barrel. Egypt is telling Egyptians to leave Libya. Italy is telling Italians to leave. At least 7 Libyan ambassadors have resigned, refusing to serve the Gaddafi regime. Events are happening so quickly that they’re hard to keep up with.